Somebody recommended your blog as a good place to start learning Dutch, but I find the DWOTD too complicated. Can’t you provide more explanation? Although a lot of readers of the DWOTD are beginners, the DWOTD is not aimed directly at beginners. Nor is it meant to be a course in Dutch. When writing the DWOTD we focus on teaching you the bit that is not covered in a textbook, or on providing you additional useful idiom. We assume you have a textbook at hand to look up things that you do not understand. Your approach seems a bit random, why are you not more thorough? One reason that we usually can’t be thorough is lack of time. Basically the way the DWOTD is now, is what we can do. On the other hand, the DWOTD is not meant to be thorough and aims to give you additional information and useful idiom, on top of your regular course in Dutch. Why are you sometimes covering words that seem useless to a beginner? We try to keep the DWOTD interesting for all readers, beginners to advanced. Note that even if the DWOTD itself seems useless, you may pick up useful idiom or get better insight in Dutch by studying the example sentences. We try to help you decide on the usefulness of a word by assigning it a category of basic, intermediate or guru. I’ve noticed that you assign a level of ‘basic’, ‘intermediate’ or ‘guru’ to a word. What criteria do you use? These categories are used to give you an indication of how likely you will be using or encountering this word. Guru words are meant for the advanced, are usually rare or specialized. We like to include guru words to keep the DWOTD interesting for all readers. I tried out some of your phrases on my Dutch friends and they all had to laugh! Are you sure you are teaching me proper Dutch? Sometimes the examples we provide have the purpose to show you how the language works and they are not necessarily commonly used. And sometimes Dutch people are just pleasantly surprised to hear foreigners speak non-obvious Dutch. Language can also be very personal or region specific of course. I live in Belgium (Flanders) and some of the words and expressions you teach me seem useless here. How come? Officially the language in both the Netherlands and Belgium (Flanders) is Dutch. Although the written Dutch does not differ much (and usually does not lead to any differences in interpretation), the spoken Dutch in Flanders (‘Flemish’) can be very different (even when leaving dialects out of the question). This difference especially becomes apparent when using expressions. The DWOTD blog is a ‘the Netherlands’ based blog, published by people living in the Netherlands. Therefore the Dutch we teach you is the Dutch you will encounter in the Netherlands. What defines a ‘Related word’? The list of ‘Related words’ often seems incomplete. The best ‘DWOTD’ definition of a ‘Related word’ is whatever comes to the author’s mind at the time of writing 🙂 The goal is not to be complete but to give you a list of words to start further exploring the DWOTD’s context. When you cover a verb, why don’t you include all conjugations? We deliberately stick to the use of example sentences to demonstrate the usage of a verb in order to keep the DWOTD format simple. If a conjugation is not covered, you will have to look it up in a textbook. Why is the audio file not always immediately available? Not always there’s the opportunity to record audio at the time of writing the DWOTD. Sander records the audio at home and it sometimes takes a while before he has the time. Why do not all DWOTDs have audio? The first DWOTD to have audio is DWOTD 366. Uitstekend. Unfortunately we don’t have the time to record audio for older DWOTDs. Can you provide audio files for the sentences as well? We would like to but we can’t really due to time constraints. I have noticed that your English translations are not always correct. Can I help you to improve your English, or to check your translations before you publish? The DWOTD is very often written ‘on the spur of the moment’ and we typically write the DWOTD on the same day of publication. We are very grateful for any corrections you may have though and welcome them as a comment on the blog. Why don’t you try to provide the best English translation? Your translations are often very literal. The DWOTD, even though explained in English, is still a Dutch blog. We use the English language to explain the DWOTD and the example sentences. Other than us making mistakes as non-native speakers, we do often choose to provide a translation that is as close to the original Dutch as possible in order to help you understand how the language works. Not always this leads to a logical (or common) English translation. Do note that we want to prevent incorrect usage of English, so please tell us when we make real mistakes. How do you decide on what will be today’s word? The choice of the DWOTD is at the discretion of the Dutch Guru writing it. It can be inspired by recent events or on request. It is never just randomly chosen from a dictionary, but it can be randomly picked from a Dutch Guru’s brain 🙂 We do have the rule that the word must be listed in the authoritative Dutch dictionary ‘Van Dale’. Why do you not publish a DWOTD every day? Sander writes the bulk of the DWOTDs and he can’t do more than 3 a week. We used to have a post every weekday, but that’s no longer feasible. I have requested a word but you never covered it, how come? Either we are receiving too many requests or we feel that the word is not suitable to be a DWOTD on its own. In case of the latter we try to cover it as part of another DWOTD. Sometimes a word is too specific to be of interest to a wider crowd, or we don’t succeed in coming up with good example sentences. I left a comment but it doesn’t show up, what now? Sometimes we have to moderate comments that are left on the blog. Due to time difference or our unavailability it can take a while before we approve your comment. We have to moderate when too many spam comments are left on the blog. We have the rule that in principle the Dutch Guru who wrote the post is responsible for answering the comments to that post. Sometimes one of us is less active on the blog for a period of time, and/or it may simply have slipped our attention, for which we apologize. You removed my comment, why? We don’t do it often, but when we remove a comment it is because we feel that it is unrelated or in conflict with our rules for posting comments. Do I need to leave my e-mail address when commenting? No, this is not necessary. But please leave a name so that we can respond to you. Leaving a name also ensures that your comment remains linked in the Recent Comments column. Can you recommend a good Dutch language textbook or course? 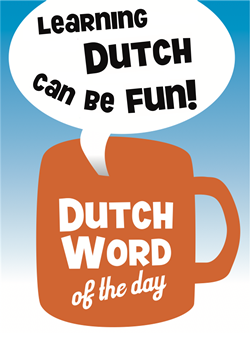 Even though we try to help you learn Dutch we are not in the ‘teaching Dutch’ business at all. We are pretty clueless when it comes to what Dutch language books or courses are available. I have a question on Dutch that is not really related to the DWOTD, where can I post it? Can I receive the DWOTD by e-mail? We used to have a mailing list but no longer support it. Read here why. If you would rather not visit our site, you can try reading the DWOTD using the RSS functionality. You can even receive the DWOTD in your Outlook mail client using RSS. Read here how to set it up. Why am I no longer receiving the DWOTD by e-mail? We have discontinued the mailing list because there were too many technical problems and we missed the user interaction. Read more here. Check out the previous question for hints on how to read the DWOTD using RSS. Or ‘like’ the DWOTD Facebook page, and you will be notified of new posts.